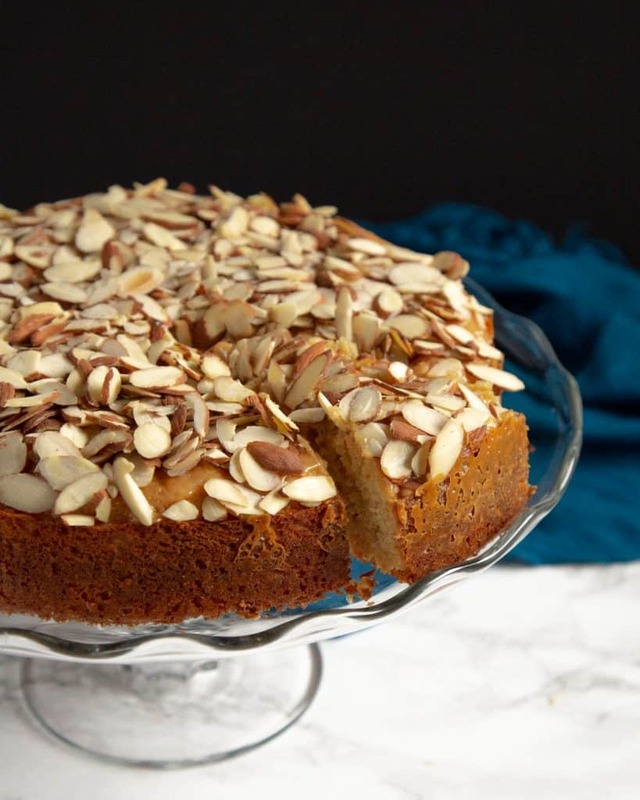 An easy and delicious Swedish inspired dulce de leche-soaked almond cake. For my March bake with The Cake Slice Bakers, I was looking for a simple dessert I could make the morning before a dinner party. 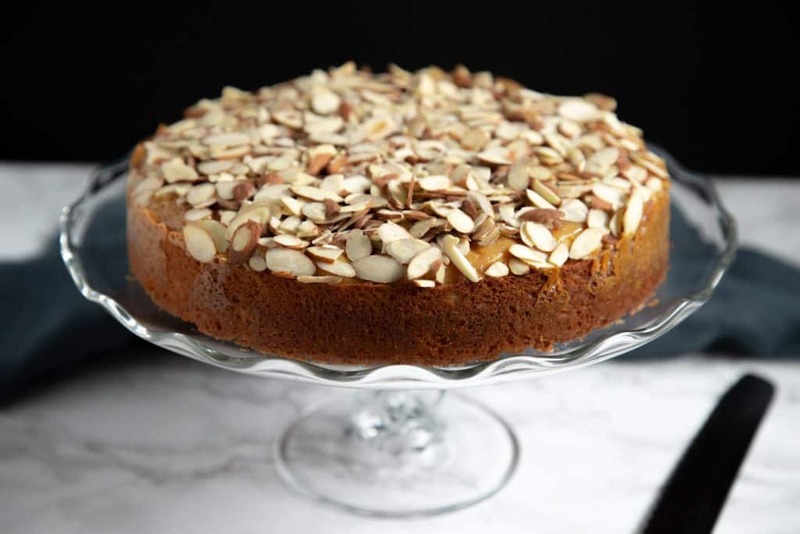 I chose this Dulce de Leche or Toscakaka Torte, a delicious Swedish caramel-soaked almond cake. I switched out the caramel for simple homemade dulce de leche that I had on hand. Dulce de leche in the batter and dulce de leche drizzled over the top… doesn’t get much tastier than that! The cake is simple and so tasty! Everyone loved it, so much that there were, unfortunately, no leftovers. Serve this dulce de leche torte warm (or warm up in the oven for a few minutes before serving if you make it ahead) with ice cream or whipping cream. This cake was inspired by Toscakaka Torte from The European Cake Cookbook by Tatyana Nesteruk. Dulce de Leche is a rich, caramel-like sauce often used in Latin desserts. You can buy cans of premade dulce de leche at the store – you’ll often find it in the baking aisle near the evaporated milk and sweetened condensed milk. 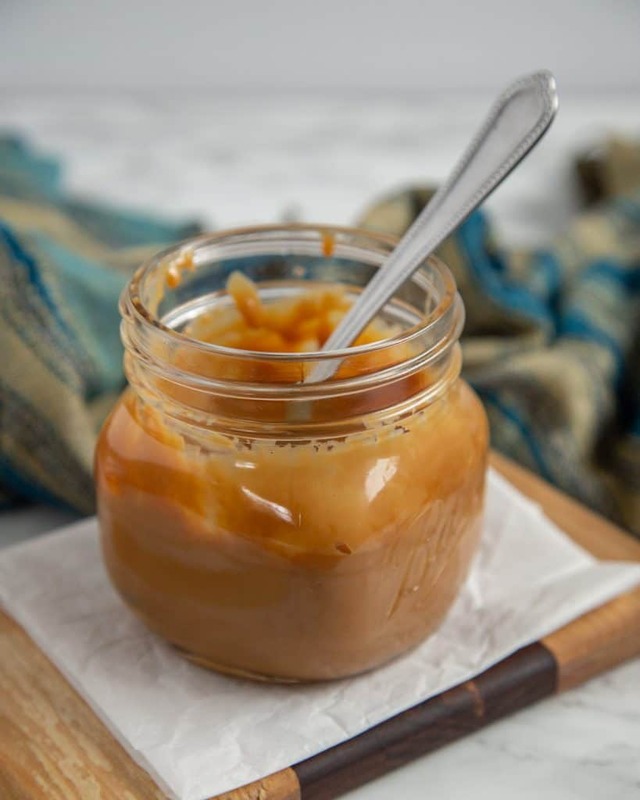 You can also make it at home using this easy recipe for Instant Pot Dulce de Leche – so simple and tasty! This cake is pretty simple to make. Start by preheating the oven and prepping a 9-inch springform pan with parchment paper on the bottom. Spray the bottom and sides, then mix together the dry ingredients: flour, almond flour, baking powder, and salt, in a bowl. Set the dry ingredients aside. Cream together butter, sugar, and dulce de leche in a large mixer bowl, mixing over high speed. Add the eggs and the vanilla extract and mix for another minute or two. Then remove the bowl from the mixer, add the milk, and gently stir it in. Sift the dry ingredients into the mixing bowl and fold in with a rubber spatula. Pour the batter into the prepared springform pan. Smooth the top and bake for 35 minutes. While the cake is baking, warm up the dulce de leche slightly in the microwave. Mix in the cream. After 35 minutes, remove the pan from the oven. Poke the cake with a fork all over the top and pour the dulce de leche over it. Spread to the edges. Then sprinkle the sliced almonds on top. Bake for 15 more minutes. Allow to cool before opening the springform pan. Serve warm with ice cream or whipped cream. Looking for some more cake recipes? Try these Caramel Honey Cupcakes using Dulce de Leche Frosting. Another delicious springtime cake is this Lemon Madeira Cake. 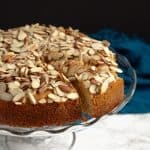 If you try this recipe for Dulce de Leche Torte, leave a review and a comment below and let me know! Preheat the oven to 335 degrees F. Line the bottom of a 9-inch springform pan with parchment paper and spray the bottom and sides with cooking spray. In a medium bowl, mix the flour, almond flour, baking powder, and salt together. Set the bowl aside. Add the butter, sugar, and dulce de leche to a large mixer bowl. Beat at high speed until the mixture is smooth and creamy. This takes about two to three minutes. Add the eggs and vanilla extract and mix again the mixture is smooth, about two more minutes. Then remove the bowl from the mixer, add the milk, and gently stir in. Sift the dry ingredients into the mixing bowl with the cake batter and gently fold in until well combined. Pour the batter into the springform pan and smooth the top. Bake for 35 minutes. While the cake is baking, warm up the dulce de leche slightly in the microwave and stir in the heavy cream until the mixture is smooth and creamy. After the cake has baked for 35 minutes, remove it from the oven and poke the top all over with a fork. Pour the dulce de leche sauce over the top of the cake and spread it to the edges. 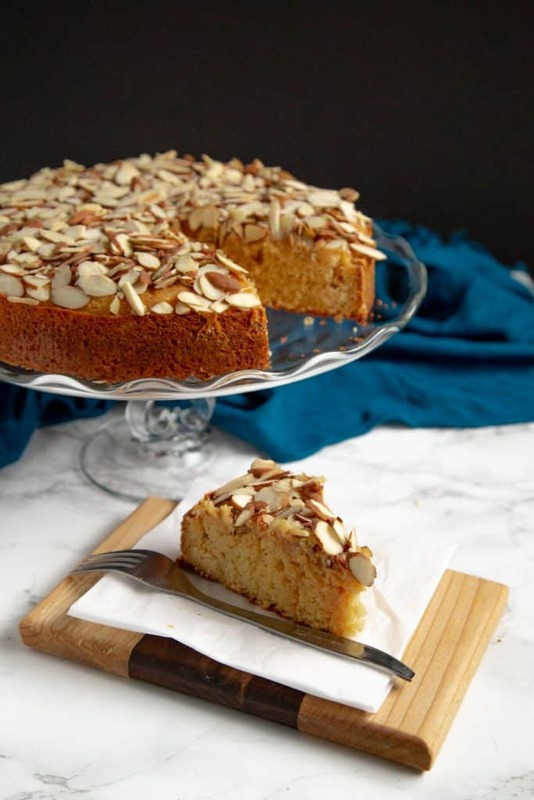 Sprinkle the cake with the almonds. Bake the cake for 15 more minutes. Then remove the cake from the oven and allow to cool. Then release the springform pan and plate. Your cake looks amazing and your photos are gorgeous! Beautiful job! Really doesn’t get much better than caramel and almonds! Gorgeous cake and I can see why there weren’t any leftovers. What a beauty! What a lovely cake! And thank you for the instant pot dulce de leche recipe. Can’t wait to try both.